Here in our sauerkraut recipes book untitled, "Sauerkraut Recipes, 12 Raw Cultured Vegetable Creations", I detail everything we've learned from over 15 years of raw cultured kraut making. In this digital ebook we introduce the process of making delicious, vibrant, naturally fermented sauerkraut's in an easy to understand manner with step by step directions for our top 12 favorites that we've made time and time again. I'll share secret tips and techniques we've learned the hard way so you don't have too. You’ll learn how to create colorful, full proof, vivacious sauerkraut's that blend unique cultural flavors and spices. Also, some top superfoods and herbs are integrated into many of these recipes which further increase their nutrient content. This sauerkraut recipes book is perfect for both the newbie sauerkraut maker or those with more experience and is especially exciting for those who want to expand their cultured vegetable repertoire! Available in ebook format, a downloadable Adobe PDF file! Taking Your Sauerkraut to the Next Level! Although we are quite fond of basic sauerkraut recipes that you can find on most websites and books on the subject, we just want to let you know that you do not need to limit your ingredients list to just cabbage, carrots, ginger, lemon and salt. I personally enjoy lots of photos when I use recipe books to keep me inspired and encouraged. It's kind of like a little vision board, with the potential end result in full color, right on the page. 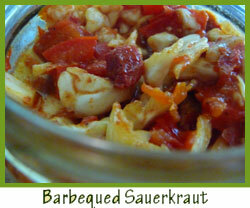 We have included many pics in our sauerkraut recipes book for this reason. 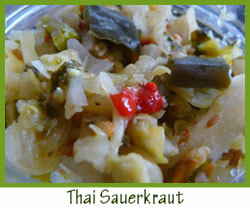 When you eat sauerkraut on a regular basis, like we do, it is nice to have more than one basic recipe to choose from. We have enjoyed, over the years, crafting sauerkraut's as a culinary art form, using different recipes every month to change things up with eclectic and enchanting new flavors to explore and delight in. This ebook is the end result of this fermentation process. These 12 sauerkraut recipes, not only keep the taste buds happy, they take things to the next level, incorporating some surprise superfood ingredients that are enhanced by a cultured powerhouse of friendly flora for your inner body ecology. Thai Sauerkraut - If you are familiar with the wonderful flavors of Thai cuisine, you will simply love this cultured collage blending the best of Indonesian food, flavors and spices. 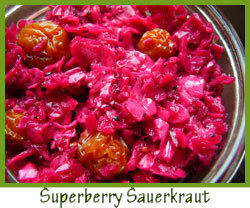 Superberry Sauerkraut - The main flavor focus of this superfood packed sauerkraut was to provide a sweet and tangy berry filled kraut, using some of our absolute favorite superberries on the planet. Barbequed Sauerkraut - This is a loved kraut specialty that tastes like it came grilled from a barbecue with a smoky sweet flavor that is hard to stop eating. 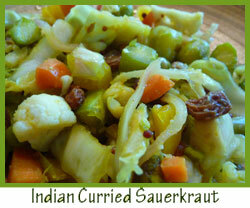 Indian Curried Sauerkraut - This one blends the best of East Indian spices and veggie combinations for a unique curried kraut taste sensation. Plus you'll get an additional 8 more recipes! Here in this 86-page ebook, we also include lots of detailed information, tips and techniques to get you started. What Exactly Makes Sauerkraut So Nutritious? How Did I Personally Learn How to Make Sauerkrauts? Over 15 years ago, I was plagued with a candida infection after taking a super-duper dose of antibiotics to kill a deadly staph infection. Soon after that I began to read The Body Ecology Diet by Donna Gates. It had just hit the bookstores and was sweeping the health conscious community I lived in at the time. This book was one of my first introductions to the idea of making homemade raw cultured vegetable recipes. When I first discovered my love for sauerkraut I spent a lot of money buying raw commercial brands. At that time, not too many people I knew were making it themselves. By nature I am a "make it homemade" kind of person, so it made sense that I would start fermenting them for myself, especially with the amount that I was eating. I couldn't seem to get enough. It didn't take long before I was concocting sauerkraut by the gallon and began sharing it with friends and neighbors. I would actually custom make labels and give small jars to people as gifts. First were the basic recipes, I got those down pretty quick, and for a number of years never really thought about other possibilities to tell you the truth. Then, one day after reading some books on the history of kimchi and sauerkraut making traditions around the world, I started to write down a few ideas. What better way to start evolving with my own recipes than to get some ethnic inspiration straight from the experts. I began using many different spices and other ingredients, along with techniques that have been used for thousands of years in these other cultures. 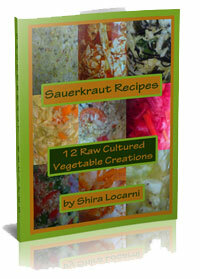 12 Raw Cultured Vegetable Creations"
"Thank you for creating this sauerkraut recipes book, I have very much enjoyed making and eating some of these recipes. They are very straightforward and easy to follow. And best of all, my teenagers even love them, which was a pleasant surprise." "Wow, these are some beautiful and tasty recipes. I have been searching for a good sauerkraut recipes book for years that goes beyond the basics. I love the pics and use it in the kitchen straight from my Ipad, so I am glad it is in digital format." Wishing you the BEST sauerkraut making adventures!